Microgreens are a great way to provide vegetables during the winter months when most of the gardening is carried out by the fireside. We know that vegetables taste best when young and fresh, it’s one of the reasons why we prefer to grow our own rather than buy. But, how young do you think they should be before we pick? We are familiar with growing sprouts of various kinds, microgreens are grown for longer, perhaps between one and three weeks. The leaves and shoots are harvested at about 5cm tall, leaving the roots behind. 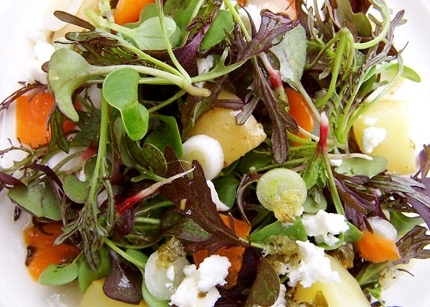 The fashion for microgreens began in the United States (where else), as an addition to salads and main courses. They are also ideal for those with limited growing space. For planting microgreens, you will need a larger amount of seed than usual because you need to cover your growing medium more densely than you would for growing normal vegetable seedlings. 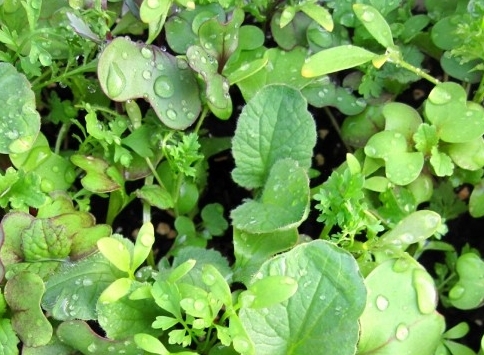 Many garden centres sell seeds specifically for microgreens. Normal packets of seed will be too expensive. Closely related to both cabbages and swedes, Turnips share a low germination temperature and tolerance of poor soils. They are a biennial plant, growing the large root as a food store to be used as an energy supply the following year. Seeds planted early in spring may flower and seed in the following autumn, so plant from mid June to July giving enough time for the root to develop by the autumn, when they can be harvested through the winter. As with many winter vegetables, flavour improves with exposure to frost. Sow seeds in drills 2.5 cm deep in rows 20-30 cm apart. As with most plants, well cultivated, free draining soil to which has been added plenty of well rotted compost. Sow seed thinly to avoid crowding, in their final growing place rather than attempting to transplant. As a member of the cabbage family, they are susceptible to clubroot, so an addition of lime would be helpful. You should sow every few days to maintain a constant supply. A normal seed tray will be large enough. Soak the seeds for a few hours before planting and sprinkle them on a free draining tray of seed mix. Lay a damp cloth over the top of the seeds until they germinate, lifting and rinsing it regularly to keep the seeds moist, an old teatowel is ideal. When the seeds have germinated, place the tray in the greenhouse or a sunny windowsill. Give them a dose of liquid fertiliser if garden soil is not used. Harvest them with scissors and put them on to the dish. For an added lift, include mustard and radish seeds.